As their customers began to abandon traditional GPS devices for smartphone applications such as Waze, Garmin developed other product lines. One of those lines is cameras. The past several years has seen several successful product lines in the dash cam and action camera space. Entering the high-end of action cameras, the Garmin VIRB 360 is a waterproof model that provides 360 video with up to 4K resolution at 30 frames per second with in-camera stitching. The Garmin VIRB 360 comes with a variety of mounting options in the box. Some of these options come in quite handy. Most notable is the 1/4″ – 20 threaded tripod cradle. This is a key mount component as it allows the Garmin VIRB 360 to use a wide variety of industry standard mounts. The 1/4″ – 20 thread pattern is common on tripods but also on other mounts for cameras. Be sure to follow Garmin’s instructions to get a stable grip on the camera. The other useful mount component found in the Garmin VIRB 360 box is the action cradle. The grooved bottom is common to what is seen on most GoPro mounts. Like a GoPro, this would require use of a tightening knob. Again, be certain to follow Garmin’s instructions to get a stable grip on the camera. The photo which accompanies this article shows the two mounting patterns. The one to the left is the pattern that would attach to the threaded tripod cradle. The adapter in the upper right shows the grooved mounting pattern used by the action cradle. This gives the reader a better idea of what the mounts needed to attach to these cradles should look like. Also within the Garmin VIRB 360 box is a small tripod grip stick which you may not use at all, especially in situations where the device is used as an action camera. This component is typically used in stationery situations. So what’s all this mean to a Garmin VIRB 360 owner? Good question. It translates to practically any camera or GoPro mount being a potential accessory for the Garmin VIRB 360. Some are made by Garmin, some by other reputable mount companies. Let’s look at a few of them. Up for using your Garmin VIRB 360 in the car? The windshield or dash is the best and maybe only location to mount a camera in the car. Consider the Garmin Auto Suction and Dash Mount for VIRB. While we aren’t normally enthusiastic with many of Garmin’s suction cup mounts, this is a good one. This mount attaches to a windshield or any smooth flat surface. The adapter required to attach the Garmin VIRB 360 using the action cradle is included. So is an adhesive disk. Like most suction cup mounts, this has a lever to get a good secure vacuum grip onto the windshield. The suction cup can adhere to the adhesive dash disk for those preferring that location instead of the windshield. The Garmin VIRB 360 can be mounted to a handlebar too. Garmin offers the Large Tube Mount for Garmin VIRB. This mount fits round diameters from .95 to 1.5 inches. Like the car mount, this kit includes adapters to fit the action cradle included with the camera. 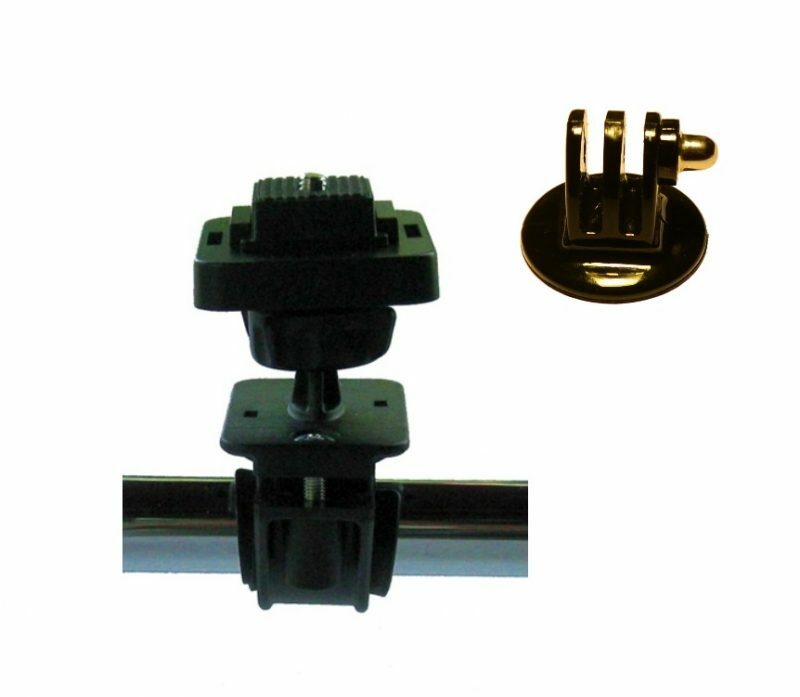 Be sure the mount is stable and sturdy after installation. We always recommend tethering the device to the handlebar for added safety so be sure to take measures to do that. Lots of body mounts are available for the Garmin VIRB 360. Body mounts can vary in quality and it’s important to get a well made model so let’s stick with Garmin on these. For outdoor action footage, a helmet mount is a good accessory to help capture the action. The Garmin Vented Helmet Strap for VIRB attaches to the vents of the helmet. Adjustable straps are used to attach the mount and lock the Garmin VIRB 30 Ultra in place. This mount is excellent for biking, snowboarding or paddle sports. Anywhere that a helmet us used. It’s worth noting there are plenty of body mounts available but many are too restrictive for practical use. Take chest mounts as an example. In our opinion, they restrict the user’s movement so we don’t recommend them. Also a note about mounts that use adhesive. They are risky. If you don’t get a mount with the proper type of adhesive and are sure to apply it properly, your new camera can go flying. We also do not recommend mounting the Garmin VIRB 360 to your wrist or forearm as it will either restrict your movement or result in useless video. Lastly, think about a traditional tripod. Consider the Acuvar 50″ Inch Aluminum Camera Tripod which will fit the Garmin VIRB 360 tripod cradle. Just screw the bottom of the tripod cradle base to the tripod and adjust the head. Be sure to place it in an area where you (or pets and children) will not knock it over. The camera is easy to install and remove from the tripod. Just a matter of turning it so the tripod screw attaches to the bottom. We covered several good mounts. As you shop for your mount, remember, any mount that says it will fit the GoPro weatherproof case will fit the Garmin VIRB 360 just fine. Additionally, mounts that have the standard tripod screw pattern will also work well.